Here’s a fun vintage luncheon size tablecloth dating from the later 1930’s or 1940’s. 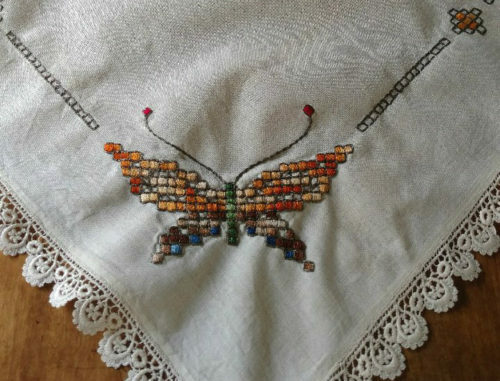 The cloth is embellished with four colorful butterflies embroidered in each of the corners. Size of each butterfly is 7″ wide x 5″ long. Overall size of the cloth is 30″ x 30″ including the lace trim. Color of the tablecloth and edging is a creamy color cotton. Color of the butterflies are rust-orange, browns, blues and greens. Each color block of the butterfly is filled with satin stitch and then outlined to set each little square apart.